METHOD, by Anna Zett via reboot.fm 88.4 FM Berlin for radia. In this spontaneous audio piece Anna Zett explores the interview as a form of monologue and a form of trialogue. 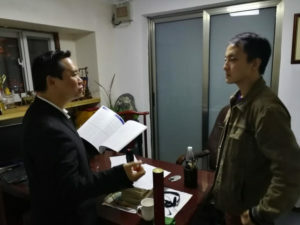 It is centered around the artist’s visit at a professional fortune tellers office in Beijing. She has brought her own deck of modernist tarot cards, he is willing to share his approach to situation analysis and fate calculation according to Chinese traditions. Mediated by a third person who is serving as translator, they enter a conversation about chance. This entry was posted in #39 and tagged Reboot.fm. Bookmark the permalink.